When the customer’s call comes in saying; “that something is wrong with the equipment because it is not cooling or heating like it should” it is not always the equipment. If we find after running the equipment thru its paces and it passes all of the check points then the next place to look is for leaks in the duct system. 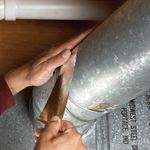 A leaky duct system is not only a loss of comfort but efficiency thereby causing the equipment to run longer and costly.